Loving… My new Jade Yoga mat I got for Christmas present from my husband. I’m not the one to run after brands (no, I don’t own any Lululemons either), but since doing quite a lot of yoga lately, I think it was a good idea to get a mat I don’t slip and slide all over when hot yoga class steaming hot and sweaty. My current mat requires yogi toes during hot class, but Jade mats are so grippy that I can leave my yogitoes home. Also, Jade’s mats are eco-friendly, non-toxic and made in USA. Plus they plant a tree for every mat sold. I just love conscious companies. Eating… Square Organics plant-based protein bars. I always have one in my bag in case I get stuck somewhere and start feeling hangry. Also, a must have after yoga class. I eat it on the bus on my way home so that by the time I get home I’m not ravenous and eat just about anything that comes my way. You get 20% off using code “KATLOVESKALE” at Square Organics. Listening to… All podcast interviews with Dr. Kelly Brogan. She is brilliant holistic psychiatrist from NY and I love listening her wisdom about drug-free treatment of mental symptoms (even though I don’t really agree with all of her dietary recommendations). And when it comes to music La La Land soundtrack has been on repeat since Christmas Eve, as well as a couple of songs from George Michael after watching a documentary about him <3. Reading…Own Your Glow by Latham Thomas. I got it from her here in SF while she was on her book tour. I’m also giving Audible a 30-day trial to see if I can squeeze in more reading when it’s audio books rather than a paper books (my reading record is pretty sad). Drinking…. My love story with Matcha continues. I admit that I’ve been getting mine from Peet’s and not sure how high quality that is, but I’ve been blending in some Ashwagandha to feel better about my choice :). And yes, I do get questions about my powder in that little blue glass jar at Peet’s. And I’m always happy to tell them more :). 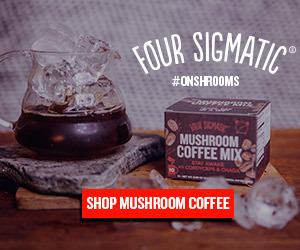 I was so happy when I saw Four Sigmatic come up with their Matcha Blend (with ginger+Lion’s Mane) and have been chugging it down for a couple of weeks now. Love it! Smelling… My lovely new essential oils! I’ve been using “Cheer” blend during the day and Immune Blend at night. My friend Kirsten introduced me to essential oils and recommended this blend to support my immune function. I rub it under my feet when I’m going to sleep and sometimes in the mornings too. It has Lemon, Oregano, Melaleuca (Tea Tree), On Guard and fractionated coconut oil as the carrier oil. Adoring… In case you didn’t know already, I have very soft spot in my heart for all animals. But this dog in our local shelter just broke my heart with her sad eyes. I want to adopt her so badly! Unfortunately Miina and Moses don’t agree. Nor our landlady. Craving… This delicious, creamy, roasted tomato soup. I’ve been all about soups for a long while now and I don’t see an end to it. Well, maybe when we’ll get our next heatwave. Also, this more seasonal Miso-Tahini Soup that is absolutely divine and a good way to use your winter squashes (I tend to collect them at our kitchen counter). Looking forward to… the New Year. I love new beginnings (maybe that’s why I don’t mind Mondays) and making plans, new goals/intentions for the brand new year. When I look at my list from last year it has few things that came through such as the big ticket item which was changing jobs. I think this year’s will be finding a new place to live (in SF Bay Area) that has a beautiful white chef’s kitchen, private backyard/balcony and lots of natural light. Quote that is appropriate to the current time… “We’ve all got both light and dark inside us. What matters is the part we choose to act on. That’s who we really are.”― J.K. Rowling, Harry Potter and the Order of the Phoenix (I’ve been listening to the Harry Potter soundtracks a lot lately). Time to clean up your home and beauty routine from toxins? Check out My DoTerra site, and take control of your health! The soup looks amazing! I need to try the immune blend. Love this post.